A whole bunch of the caterpillars in the lab have shut down for the winter. We have been expecting this, as both the Gorgone and Baltimore Checkerspots overwinter as caterpillars of about this stage. They have been caged with fresh leaves, and have stopped eating them over the last couple of weeks. Instead, the caterpillars just sit in small groups on the tops of the cages not moving much. Time to put them into their winter quarters. 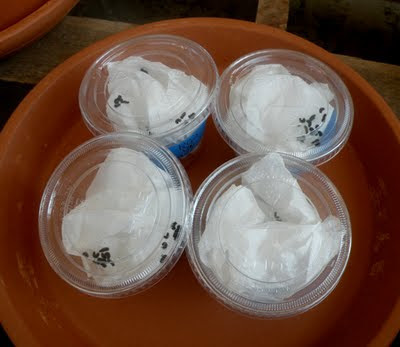 The larvae are placed with crumpled paper towels in small plastic food cups. Over time, they will work their way into the folds of the paper towels. Some caterpillars will even silk the folds of the towels together. 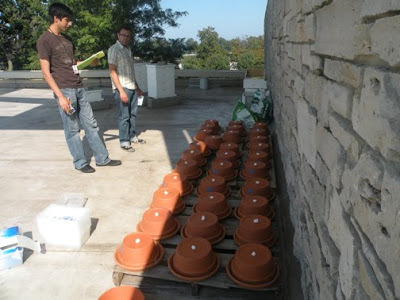 The cups go on a terra cotta sauceer, and a terra cotta pot is inverted ovet the top. The drain holes in the pots are plugged with gauze to keep marauding insects out. The whole affair is stored in a shaded area up on the roof of the Nature Museum. Last year, about 70% of the gorgone checkerspot larvae that we placed in these cages survived the winter, and all survivors went on to become adult butterflies. On Friday we placed 512 Gorgone Checkerspot caterpillars and 1256 Baltimore Checkerspot caterpillars into these cages. The field season isn't over- but it is winding down. If I hadn't been blessed with a career I loved that gave me some truly incredible rewards for brutally hard work at times, I would envy you fiercely. But I admire what you do and the enthusiasm and joy with which you go at some vitally important work. Amazing job you have there. Glad you and your crew are doing such a great job for butterfly conservation. Very interesting post and I learned a couple of things. Well done, Doug. It's good to hear about these success stories! you do put in a lot of energy - and love - into your occupation. I wish you could organize a nice long nap for me, and if I had wings at the end of it, that would be fine too. Will- Thanks. You have had a pretty awesome career, too. Amila- I've never done much with video. I don't even own a dedicated video cam, though my regular camera will shoot video. I'll try to take the challenge sometime soon and post one. Randy- Thanks. These days my crew does most of the actual work. Steve- Glad you liked it. Dave- This year, I'm glad that it has been more success than otherwise. FC- Wish I could take credit for it. This was taught to us by colleagues in Oregon. Spo- It's not just a job, it's an adventure. Pablo- I think that pupation would be an excellent substitute for puberty. Tuck those babies into bed Doug, you will be dreaming of spring before too long yourself! I hope they all sleep well!